“Call Me Irresponsible” was written for Fred Astaire to sing in the movie Papa’s Delicate Condition. 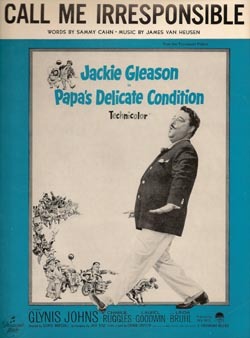 However, due to contractual obligations, the role went to Jackie Gleason, who introduced the song. “Call Me Irresponsible” won the 1964 Academy Award for Best Original Song. “Call Me Irresponsible” was recorded in June 1992 and was released that year on Perfectly Frank. It was arranged by Ralph Sharon.